To manage Shopify web orders from SooPOS, first access the POS menu. 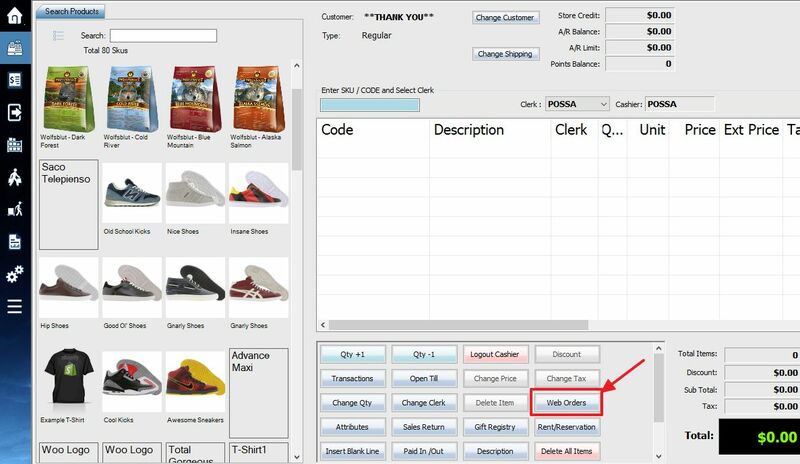 Select Web Orders from the bottom of POS screen. Web Orders Management screen will pop up. Select Date and status, and click the Refresh button. Double click the order or click the View Selected button to open and print the order. Click the Edit Online button will open the web browser and bring the order, so you can edit the order from the back end of your Shopify website. Web Orders in SooPOS are not invoiced transactions, therefore, they are not part of the sales and are not included in the sales report. Even if you set web orders status to completed, the web orders are still treated as layaway, the inventory is taken out of your QOH and put as quantity on-hold. Once the web orders have been finalized the QTY will be taken out of the quantity on-hold column. To finalize web orders, select the orders and click the Finalize / Invoice button.